The First Lady was beaming as she watched her husband speak. Source: Getty. Most spouses like to support their partners at important events throughout their career, and Melania Trump appeared to be beaming with pride as she attended her husband’s second State of the Union Address since taking office in January 2017. 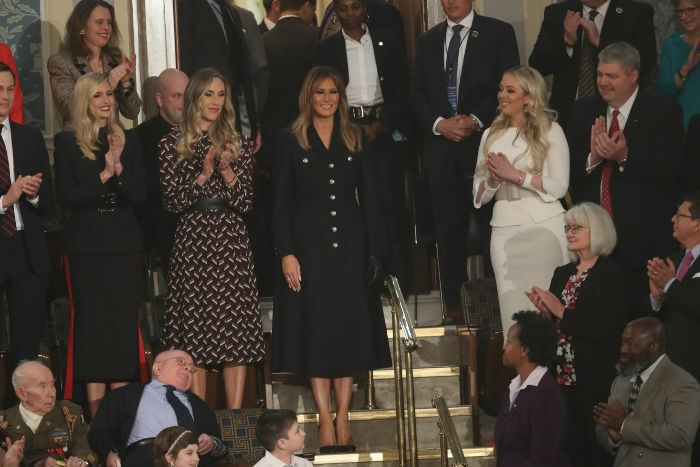 The First Lady looked sophisticated in a classic button-down black dress coat, which featured eye-catching silver buttons and finished just below her knees, as she arrived at the US House of Representatives inWashington D.C. on Tuesday evening. Slovene-born Melania, who has been married to the current President of the United States since 2005, was the picture of elegance as she stood in the crowds alongside a number of Donald Trump’s children, including eldest daughter Ivanka, for the momentous annual event. The 48-year-old wore her light-brown locks loose over her shoulders with distinct smoky eye make-up and completed the outfit with a classic pair of black heeled court shoes and a pair of black leather gloves. Melania was seated next to two young children, who were Trump’s special guests on Tuesday evening. Source: Getty. Ivanka seemed to echo her mother-in-law’s style, also opting to step out in black from head to toe. The 37-year-old wore a black pencil skirt, which featured a bold red trim down each side, with a fitted blazer jacket, pulled in with a statement leather waist belt. Read more: Melania Trump glows in all brown ensemble for trip to Florida. The State of the Union (SOTU) Address is an annual message delivered to both chambers of the US Congress – the Senate and the House of Representatives – at the start of each calendar year, which typically includes a budget. The First Lady shared her excitement for the event with her 11.5 million Twitter followers. “@POTUS and I are honored to welcome our inspiring guests to join us at #SOTU,” she tweeted. “Each of them have a story – however painful, joyful, or hopeful – these stories bring all Americans together.
.@POTUS and I are honored to welcome our inspiring guests to join us at #SOTU.Each of them have a story – however painful, joyful, or hopeful – these stories bring all Americans together. Trump used his second SOTU to speak about a number of issues, including investigations into his own conduct, ongoing tensions between himself and Speaker Nancy Pelosi, immigration and his promised border wall between the United States of America and Mexico. The First Couple were in Florida for the weekend with their 12-year-old son Barron. Source: Getty. Earlier this week, the former model, who is known for her glamorous sense of style, opted for yet another understated outfit as she joined her husband for an outing during a trip to Florida with Donald and their 12-year-old son Barron. 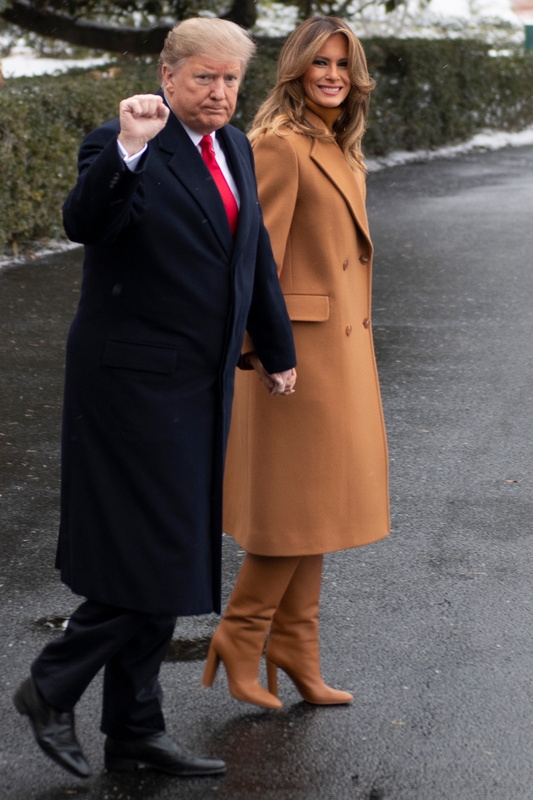 The First Lady kept things classy and simple in a long brown, buttoned coat, to ward off the chilly weather, which she paired with matching knee-high brown boots. What do you think of Melania Trump’s style? Would you wear something like this?